Would you like to create a video gallery for your site? With Envira Gallery Videos Addon you can easily create a beautiful video gallery. The Videos Addon will accept many different video services for your gallery. 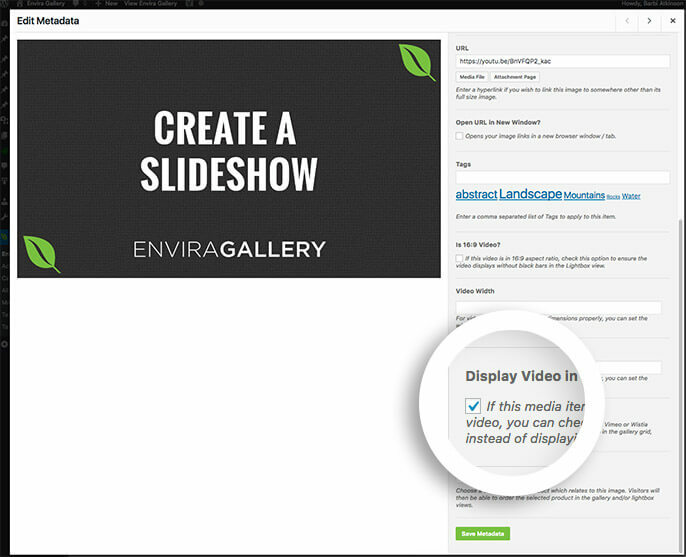 In this tutorial we’ll show you how to create a video gallery using Envira’s Videos Addon. Can I remove the black bars above/below my 16:9 videos? How can I make videos play in the gallery without the need of a lightbox? Can I use videos from Amazon S3 server? Why aren’t my lightbox themes working on the video lightbox? Why is my video muted on autoplay? How can I stop the related videos from showing? Will I be able to change the poster image? Why isn’t the autoplay working? Why isn’t my Facebook video working? Can I use the Videos Addon and the Dynamic Addon together? In this instance, you’ll be activating the Envira Video Addon. Currently Envira supports self hosted videos (mp4), YouTube videos (playlists from your account and specific start times), Vimeo videos, Instagram videos, Facebook videos, Twitch videos, VideoPress videos and Daily Motion videos. 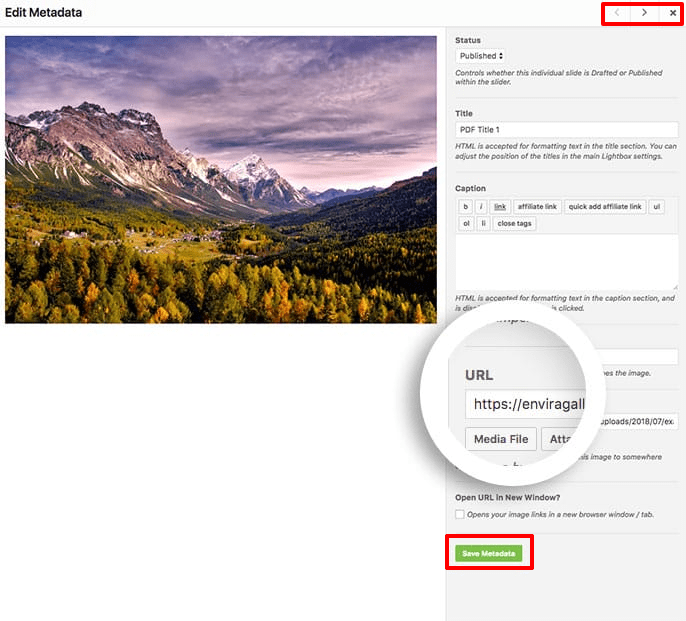 If you’re going to be using the YouTube playlist for your video galleries, you’ll need to get a YouTube API and enter it in Envira Gallery » Settings » Video tab. To do this, please follow our help guide on getting and saving a YouTube API. If you’re not going to use the playlist functionality, you can skip this step. Once the Videos Addon is activated, you can begin adding videos to your gallery. You can add videos to your gallery in two different ways. Below we’ll run through each possible way. To add videos directly, click the Insert Files from Other Sources button and from the menu on the left of the pop up window, select Insert Videos. You’ll then see a button to Add Video, click this to being adding videos to your gallery. 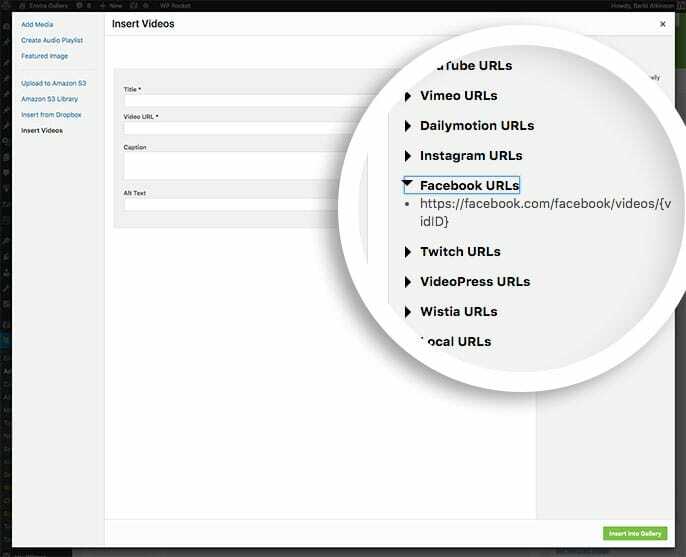 You can see from the examples on the left the accepted URL formats for your video links. Click the X icon to close this window when you’ve added all your videos to the gallery. 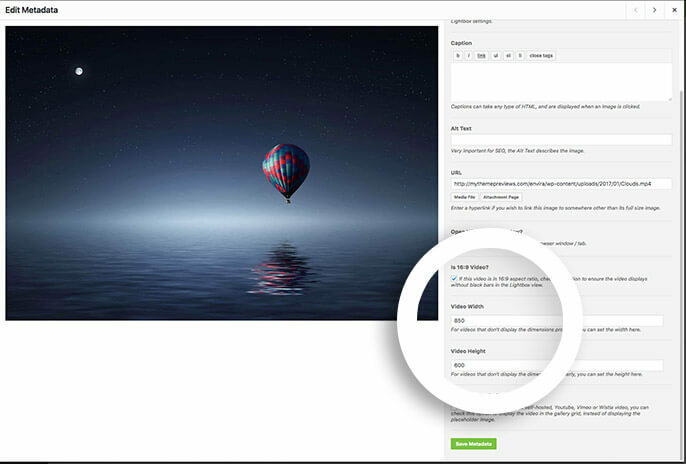 As you insert your videos, Envira will go out and get the poster image for each video and insert this into the gallery but also into your WordPress Media Library. Once you’ve added the videos, you do also have the option of editing each of the videos to choose if you would like to show your video from the gallery view. To do this, click the blue pencil icon to edit the first video. The Edit Metadata window will open and you can choose to display the video in the gallery view by clicking the box for Display Video in Gallery? Alternatively, you can just add images to your gallery as you would any other gallery. Then clicking the blue pencil icon to edit the image, just change the URL field to point to the video URL. Click the Save Metadata button to save the changes and using the right and left arrows keys in the top right, navigate through the remaining gallery images to update any other URLs. When you’re all done, click the X icon to close the Edit Metadata window. Your next step is to set up your video options on the Video tab. That’s all! 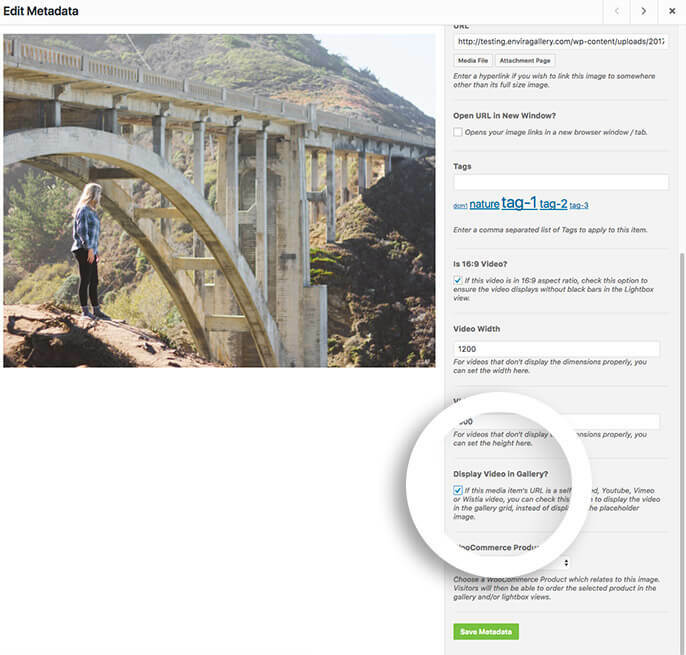 Now you’re ready to create a fully-featured video gallery on your site. Interested in learning more about creating engaging content for your site? See our guide on how to create a cinemagraph from a video using Photoshop. Q: Can I remove the black bars above/below my 16:9 videos? A: Yes! First, edit a gallery and select the pencil icon for the thumbnail image that links to any 16:9 ratio videos in your gallery. Q: How can I make videos play in the gallery without the need of a lightbox? A: First you’ll need to edit your gallery. Select the pencil icon for the thumbnail image that links to any video URL in your gallery. This will open the Edit Metadata screen where you can enable the Display Video in Gallery? option. Save the changes and your video will now play in the gallery view instead of opening in lightbox. Q: Can I use videos from Amazon S3 server? A: You can currently use videos from Amazon S3 servers. In order for this type of gallery to be displayed correctly, you will need to make sure the Display Play Icon over Gallery Image? is unchecked. 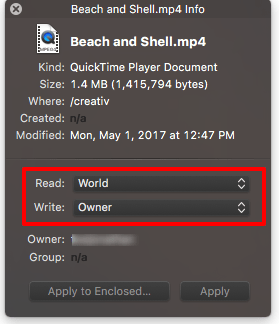 Also you’ll need to make sure the permissions on the video for the Read access is World. We have a demo to view. 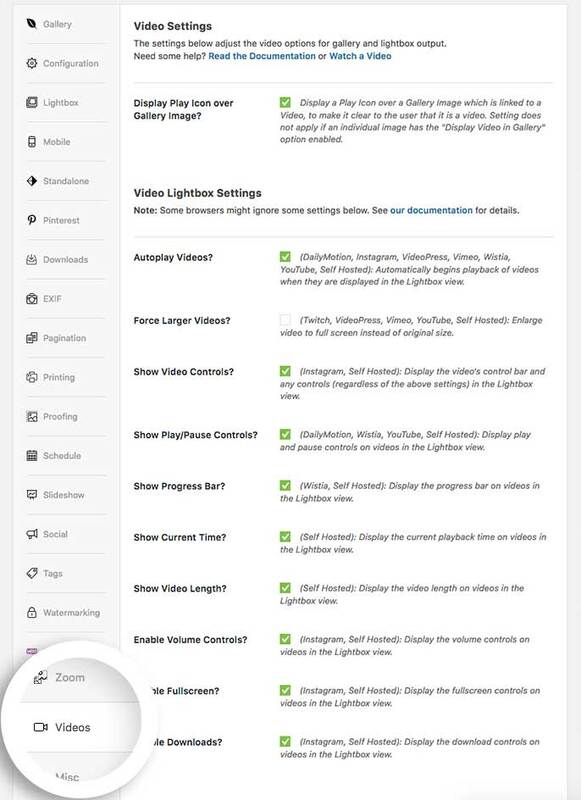 Q: Why aren’t my lightbox themes working on the video lightbox? A: When using videos in your lightbox, Envira will remove borders from the video to give full impact to the videos and therefore you don’t really see a difference from 1 lightbox theme to another when dealing with videos. Q: Why is my video muted on autoplay? A: Certain video service providers won’t autoplay the video unless the video is muted. Unfortunately this is not in control of Envira. Q: How can I stop the related videos from showing? A: Unfortunately we don’t currently have the permissions in the API to stop the related videos from showing at this time. Q: Will I be able to change the poster image? A: Absolutely! If you want to change the poster image of the video, just click the blue pencil icon to edit the metadata of the video. On the right, scroll down until you see Video Thumbnail. 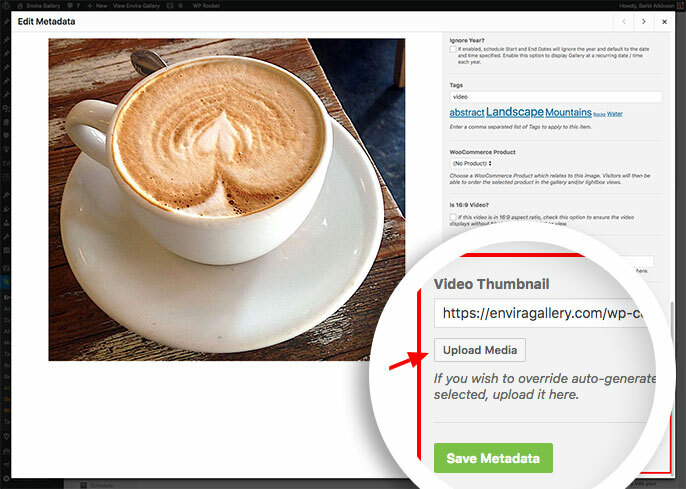 You can select Upload Media to change the poster image and then click Save Metadata to save the changes. It’s important to note that you can’t just copy and paste a URL into this field, you must click the Upload Media button and select an image from your Media library. Q: Why isn’t the autoplay working? A: Autoplay isn’t supported on all video services so if you have the Autoplay Videos? enabled but it’s not autoplaying, this is likely because it’s not supported. Twitch videos will automatically autoplay regardless to the setting. That comes from Twitch and isn’t controlled by Envira. Q: Why isn’t my Facebook video working? 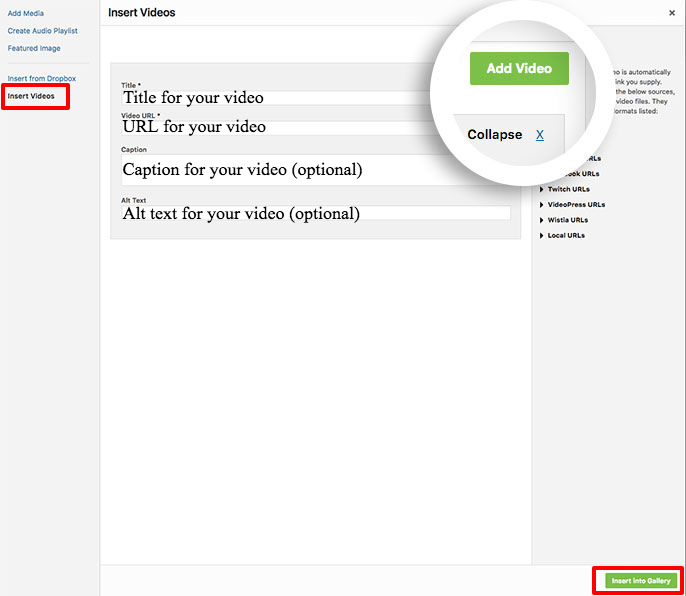 A: Make sure the URL for the Facebook video matches the examples we’ve provided to the right when entering a video. Q: Can I use the Videos Addon and the Dynamic Addon together? Fix: Remove PHP warning on adding certain videos. Fix: Issues with some videos not loaded resolved. Enhancement: Updated video admin UI w/ additional settings. Enhancement: Ability to add YouTube video with timestamp. Added: YouTube Playlist support (requires api key). Fix: Wistia support in Lightbox. Fix: Better support for autoplay for certain videos types. Fix: Replaced Froogaloop and updated API for Vimeo. Fix: Better compataiblity with XTheme. Added: You can now use the format as urls: youtube.com/embed/XXXX. Fix: Self hosted videos no longer show horizontal and vertical scroll bars. 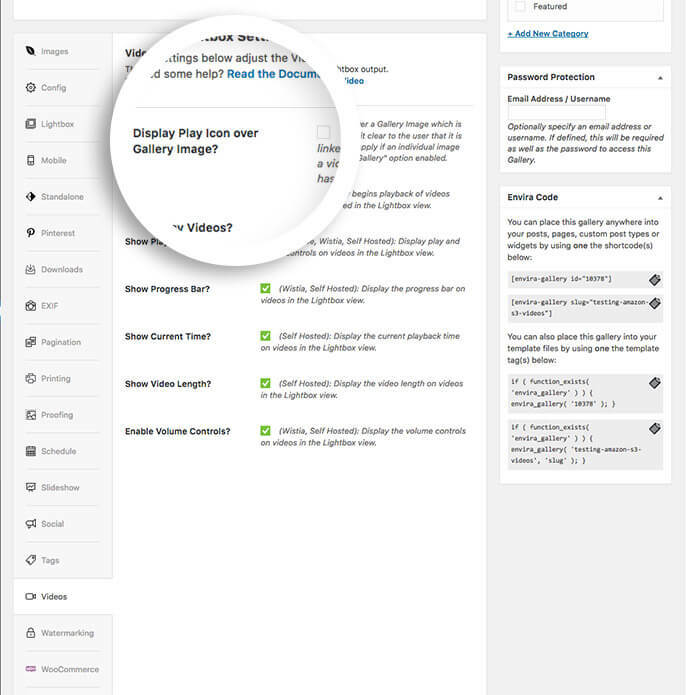 Fix: Wistia Options not properly setting. Fix: Output not filling lightbox. Fix: Pagination addon ( load all in lightbox ). Fix: Conflict causing social buttons outside of lightbox with video addon resolved. Added: Is 16:9 Video option to Edit Metadata when editing an image; allows video to be displayed in 16:9 format without black bars in the Lightbox view.